White Opal: Two white opals cut from material mined in Coober Pedy, South Australia. They are calibrated cabochons measuring 8 x 6 millimeters. "Light opal" and "white opal" are terms used for opal material that has a white, yellow or cream body color. 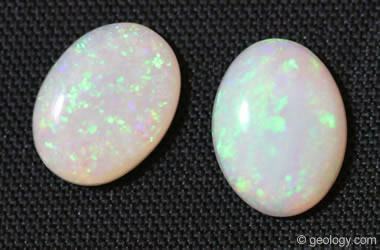 This is the most common bodycolor for precious opal. The stones in the photo were cut from material mined at Coober Pedy, South Australia. They are calibrated 8 x 6 millimeter cabochons.